Donald Trump picked the wrong city and the wrong congressman to criticize on Twitter. But in the #defendthe5th tweetstorm, let’s not forget what’s most important: What Lewis accomplished and what he stands for. The first response was stunned disbelief among the political class that Trump, whose capacity to insult via Twitter is staggering, had gone too far. Lewis is universally considered an icon of the modern civil rights era. One thing Lewis is not considered: a man of inaction. He was beaten during the 1965 march in Selma, better known as Bloody Sunday, that led to the Voting Rights Act. With more than 40 arrests for civil disobedience to his name, the septuagenarian hasn’t slowed down; this summer Lewis led a sit-in at the U.S. Capitol to protest gun violence. “On this Martin Luther King Jr. weekend, let it be clear that John Lewis is an American patriot. Trump’s attacks on him further confirm it,” tweeted 2016 Independent presidential candidate Evan McMullin. “It’s telling, I’m afraid, that Donald Trump treats Vladimir Putin with more respect than he does John Lewis,” commented conservative commentator Bill Kristol. “@RepJohnLewis is an American hero & a national treasure. Period. Full stop,” tweeted Atlanta mayor Kasim Reed. Meanwhile, Atlanta residents swiftly flooded Twitter with #defendthe5th dispatches from Lewis’s “horrible” Fifth Congressional District, a swath of metro Atlanta that has a population of 737,000—nearly the same size as the entire state of North Dakota—and includes the world’s busiest airport, the Centers for Disease Control, the historically black Atlanta University Center, Emory University, Georgia State, Georgia Tech, and neighborhoods such as Buckhead, Inman Park, Cascade Heights, and Decatur. Jason Carter, grandson of Jimmy and 2014 Georgia Democratic gubernatorial candidate, tweeted that the biggest recent failure he could recall in the Fifth was Trump’s abortive effort to erect a namesake tower in Midtown. For someone who claims to possess real estate genius, Trump seems fixated on a mental image of cities formed by newsreels of 1960s riots—or perhaps by too many episodes of The Wire or repeated viewings of Blade Runner. Almost two-thirds of Americans live in cities, and we would hardly do so if they were all crumbling, crime-filled infernos. Yes, Atlanta has pockets of blight, repeatedly engages in development at the expense of its poorest residents, and has a staggering income gap. But Atlanta, the city, is gaining residents and experiencing a real estate rebound. Same story in cities nationwide. So, good for you, Atlanta, rallying to correct Trump’s trapped-in-fiction take on urban America. In the 1960s, Lewis, the son of sharecroppers who honed his oratory in his parent’s chicken shed, led students in sit-ins at Nashville lunch counters, joined the Freedom Riders to integrate interstate bus lines, co-founded the Student Nonviolent Coordinating Committee (SNCC), and addressed the nation as one of the “Big Six” civil rights leaders at the March on Washington (where King gave his famous “I Have a Dream” speech). During that decade, Trump, the son of a real estate developer, attended Fordham and Wharton and avoided serving in Vietnam thanks to multiple draft deferments. Trump, whose real estate holdings expanded with eponymous hotels and casinos and whose profile skyrocketed thanks to his bestselling book, The Art of the Deal, personified the “greed is good” zeitgeist of the Eighties. Lewis, elected to Congress in 1986, became a consistent voice for voting rights. In the 1990s, Trump’s business suffered setbacks and by the 2000s, after a short-lived fling with the idea of running for president, he branched into a career as a reality TV star. He made a name in political circles by continuously questioning President Barack Obama’s citizenship. Lewis, continuing to represent Georgia’s Fifth, moved into an unlikely new phase as a fixture on the sci-fi convention circuit with his National Book Award-winning, three-volume graphic novel memoir, March. Given the hyper-partisan spirit of the country in general and social media in particular, it is not too surprising that among the many social media statements in support of Lewis after Trump’s attack were those downplaying his accomplishments. “John Lewis is not a “legend”–he was a minor player in the civil rights movement who became a nasty, bitter old man,” tweeted conservative pundit Dinesh D’Souza (who went on to question whether Rosa Parks really did anything by giving up that bus seat in Montgomery). While comments like D’Souza’s are rooted in partisanship, dismissing Lewis as a “minor player” displays a basic lack of historical knowledge. It’s good to know that, in response to the social media furor, Lewis’s 1999 memoir Walking with the Wind sold out on Amazon, while March claimed the top spot in sales. Some Americans might be brushing up on recent history. Today, the country pauses to honor King, Atlanta’s most famous native son and the most famous civil rights leader. But we should also reflect on the thousands of others who, like Lewis, risked their lives to fight for social justice and voting rights. So many veterans of the civil rights movement live in Georgia’s Fifth that sometimes Atlantans seem to take them for granted. When I moved to the Fifth in the 1980s, Andrew Young was mayor, I registered to vote at a drive hosted by Coretta Scott King, and, yes, the first congressman I voted for was Lewis. In Atlanta it’s not uncommon to run into a living legend like Lewis or Young at the bank or Home Depot, nor to strike up conversation with a stranger while waiting in line and discover that the person you’re talking with marched in Selma, too, or was arrested trying to get served at the Five Points Woolworth. So yes, Atlanta, #defendthe5th and keep posting photos of your brunch and kids, of the skyline and the murals and the gorgeous homes of Inman Park and Cascade. But don’t lose sight of what John Lewis really represents, not an area on a map, but the universal truth that all people are truly equal. 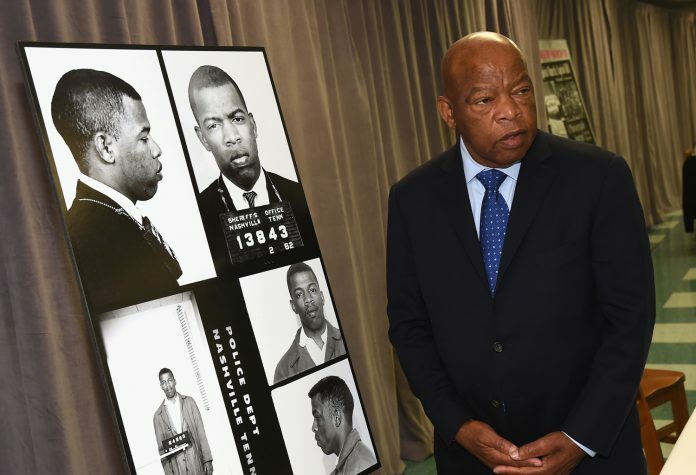 Donald Trump, you are wrong that John Lewis’s district is a crime-infested hellhole. You’re wrong that Lewis is “all talk.” You’re wrong about America’s cities “burning.” And picking a fight with a man who’s dedicated himself to fighting for justice and peace is just . . . sad! Rebecca Burns is the publisher of The Red & Black, the independent news organization that covers the University of Georgia, and an adjunct professor at the Grady College of Journalism and Mass Communication. Her two decades as an Atlanta journalist include seven years as editor-in-chief of Atlanta magazine. She moved to Athens a year ago after living in Atlanta for 30 years. She tweets at @RebeccaBurns.